The French is the epicurean’s tournament, where the kiosks feature crepes filled with apricot jam and dusted with powdered sugar, and ice cream bars favored with Grand Marnier; where hot dogs doze in light, crisp rolls that resemble sleeping bags; where these and other specialities evolved through centuries of respectful doting on the sensitive receptacle that for some peoples is a mere stomach. The French tournament site, like those of Wimbledon and the US Open, is located just far enough outside the city to achieve a slumberous, almost pastoral quality. 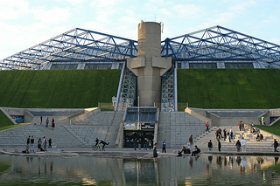 The Stade Roland Garros borders the Bois de Boulogne, the rambling park that contains the famed Longchamp Race Course and the Racing Club de France. The stadium and its grounds, named after a World War I aviator killed in action, were constructed in 1927 primarly for the defense of the Davis Cup. 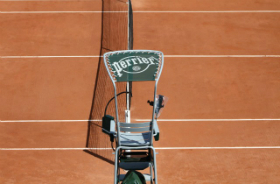 Despite the French preoccupation with style, there is a monotonous, almost martial quality to Roland Garros. 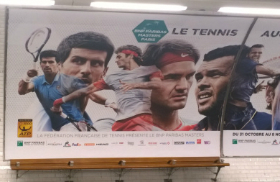 Yet this grim undertone strikes a symbolic note, for the French is the most grueling tournament in the world. The Italian assaults the nerves, Wimbledon tests the spirit, and the US Open challenges the will. The French attacks the body and often defeats a player through sheer exhaustion. 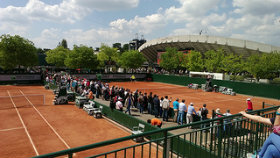 Matches routinely last four hours on the slow clay, and despite the draw of 128, five-set matches are the rule from the start. Tennis at the French is trench warfare; lobs are lifted like deadly mortars, except they almost always come back. Battles that commence while the idle are still taking croissants and café au lait on the the Boulevard Saint-Germain last long into the dusk. As late as nine in the evening, there is still enough light to keep the contestants engaged. I knew my daughter Steffi was going to be a tennis champion when she was not yet 4 years old because her hand was stronger than most 6 or 7 year-old boys and girls. I noticed this when she held up her racket, the handle of which I had cut down so she could play at the club where my wife and I also played. I have to admit, this was not tennis back then. Everyone says Steffi started playing tennis when she was 4, but you can’t do that. We only played for four, five, or six minutes a day. Six months later, maybe it was 10 or 12 minutes, but it was always for fun and only as long as she wanted to play. One thing we did during that time was gamble. We put a string between two chairs in the living room. I’d say, “O.K, now if you hit the ball over the net 10 or 15 times, you get Pepsis.” I would challenge her by saying, “I don’t believe you can do it.” But she always did. We started playing in the living room, but pretty soon Steffi was hitting so hard she was breaking the lights on the chandelier. My wife had to buy more and more lights and she was getting mad. I had to say, “Steffi, one more light … you hit too hard.” Finally, I sold my billiards table in the playroom downstairs and we started playing there. Even at that early age Steffi was very competitive. She wanted so badly to get the ball over 15 times. Then she would say, “Papa, if I hit 20 times …. ?” and I said, “if you hit the ball 20 times over we make a party.” And she did, so we had a big party with ice cream and strawberries and – most importantly – music. Steffi loves music. I always knew Steffi had special talent. I had taught 6- to 8-year-old players, and Steffi was different. She always had her eyes on the ball. Nothing distracted her. Even if the phone rang, she never looked away. You think she has great concentration now; she was always that way. a smaller girl, but Steffi was just much stronger. But the most important thing was that Steffi always had fun with tennis. I saw so many players whose parents put pressure on them. They would say, “You have to play tennis today.” With Steffi you never had to say that. With her, I would say, “O.K, I think we can play today,” and then she was always at the court earlier than the time we were scheduled to play. I have always been Steffi’s coach. Now other people, like Pavel Slozil, travel and hit with her, but I know her game best. I taught her the technical skills and still work with her all the time. The good thing about Steffi is that she likes to learn. Now she’s not so easy to teach because she knows the game. She is stubborn and very critical of herself. After she misses a shot, she knows what she did wrong and doesn’t want to hear it from someone else. Tennis is a very individual sport and everyone who plays is an individual. That’s why it’s hard to teach someone to play in a group. 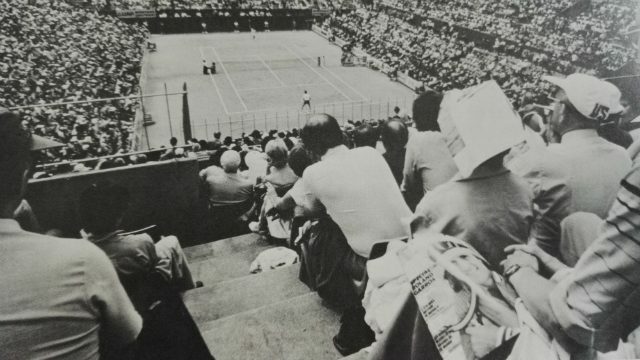 In West Germany, tennis is organized. We have one and a half or two million organized players. In Leimen, where Boris Becker practiced (and Steffi did too sometimes), there were about 14 good players and three courts in the hall. 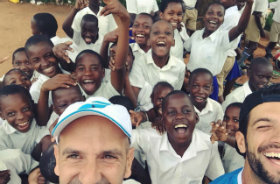 There were four boys and girls on each court and it was impossible to teach individually. So when Steffi was 8 I sold my car company and built a tennis hall near our home. That way I could work with Steffi individually. That was very important. We would work together for one or two hours every day and I knew exactly what was good for her and what wasn’t. Steffi won two sets in about 20 minutes. The point here is that every player is an individual. Steffi was not a topspin player so it was not right for her to change her game to suit someone else. Borg is an individual, and so is Steffi. About six months later, Manuel Orantes won the 1976 Masters using a slice backhand; all of a sudden the coaches were telling us that Steffi must learn to hit a slice backhand. I felt the coaches were saying that to be a champion all players had to do the same thing. But I decided to make my own way with Steffi. She had to play the way she wanted to play with the shots she had in her head. So there were some people who were against us, but Steffi became the European champion at 11, 12 and 13 years old. And instead of playing topspin, she hit a normal, very fast ball; it worked for her. What I learned from this is that sometimes you have to fight for things. That is not always my mentality, but I wanted to take all the pressure off Steffi and put it on my small – or not so small – shoulders. It was very important that I went my own way at this time and that is why I didn’t have so many friends in tennis. We went the way that was right for Steffi and maybe not right for 99.9 percent of the other players. I know that people have compared me with Roland Jaeger, but I am not Mr. Jaeger. I don’t even know him, but he did say hello to me once at the Orange Bowl when Steffi was 13. At that time I knew my image was not so good. I hope that has changed, but if you have to make your own way, you can’t always worry about your image. I have also learned a lot since we first came to the United States that year. It was never my way to make big problems for others, but I know in the beginning I made some mistakes. But not everything was my fault. Once in Berlin, when Steffi was 14, she was asked at a press conference if she would like to play Federation Cup for West Germany. She was only No. 5 in the country at the time, but she said, “Yeah, sure, why not?” Well, one man thought she meant she didn’t want to play and kept asking her why not. I came into the room at this time and said, “Now it’s done, finish please. It’s unbelievable what you are doing to my daughter.” And there were about 40 or 50 people there and they all said to me, “Why did you do such a stupid thing?” But Steffi didn’t know to just say, “If I’m invited, I’ll play,” and end it, so I had to help her. These things gave me an early reputation. But I think that is changing now and people realize that the only person I always cared about was Steffi. Family support is one of the most important qualities in developing a champion. Steffi has a brother, Michael, who is now 16 years old and also likes sports, but not anything special. He likes skiing, is a very good track and field runner, likes basketball and dancing, and is not a bad tennis player. And he’s good in school. He will probably become a doctor. Steffi and Michael are very close. Whenever Steffi calls home, the first thing she asks is, “What is Michael doing?” And that is very important. She likes her family and the support we give her. She also knows that I love my son the same as Steffi. Sometimes she says, “Oh, Michael has an unbelievable life because he can do everything.” But she also knows how lucky she is and what we have done for her. The day before Steffi left to go to the States after her holiday at the beginning of the year, we had a big party for her at a disco and it was unbelievable. Steffi was absolutely crazy. There were so many friends there, boys and girls, and Steffi danced so much. Off-court, she is a normal girl and much nicer than people can see on-court. beginning to understand that the way Steffi is on-court – she looks so strong – has nothing to do with herself. She only concentrates on the match. After that, she is absolutely normal, laughing and singing and dancing like other girls her age. But in tennis, Steffi goes her own way. Perhaps the most important thing I’ve learned is that you can’t make a champion. You can help, but a champion makes herself. One of the craziest anomalies of the 1960s, a decade in which the great champions were bared from the great tournaments, concerned two Spaniards born within nine months of one another duing the Civil War. There was nothing to choose between their levels of performance. But Andres Gimeno turned professional in 1960 and played his best tennis in the proud, exclusive environment of Jack Kramer‘s tour. Towards the end of the 1960s, only Rod Laver and Ken Rosewall were better players. But superficial historians may recall Gimeno only as the chap who, at the age of 34, won the 1972 French championship from an unusually modest bunch of challengers. By contrast Santana stayed in the ‘shamateur’ ranks, picked up an impressive array of Grand Slam titles, had a wonderful Davis Cup record, became a national hero, and captivated everybody in sight. So Santana received far more publicity and achieved a bigger reputation, except among the cognoscenti. 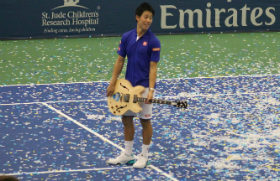 Santana played no better than Gimeno did but had the more spectacular game, the more crowd-pleasing court presence, and probably a greater depth of competitive self-belief. First a word about Gimeno, who was Santana’s Davis Cup teammate from 1958 to 1960 and 1972-1973, winning 17 out of 22 singles and breaking even in ten doubles. Gimeno was 6ft 1 1/2in tall but looked even bigger because he was straight-backed, held his head high, and had a tiptoed style that suggested he was wary of damaging the court. His bearing was patrician, his manner courteous, his game elegant. Gimeno stroked the ball with the teasing flourish one associates with the bull-fighting breed. The forehand was his stronger flank and although it was sometimes said his backhand couldn’t break an egg, he placed the shot shrewdly. Gimeno had a sure touch and made effective use of the lob. There was a purpose behind every shot he played and his game was as tidy in detail as it was sound in conception. But he had nothing that could really hurt his opponents and on big occasions he tended to be too highly strung, too diffident, to do himself complete justice. 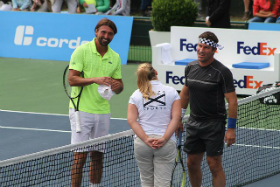 Gentleman that he was, Gimeno may have had too much respect for the likes of Laver and Rosewall. Santana was the Ilie Nastase of the 1960s: less of an athlete, true but more disciplined in his conduct and his match-play, and in the same class when it came to artistic wizardry. An example of the shots they had in common what that rare flower, the chipped forehand, which both played with such facility that they might have been picking daisies. The joyous feature of their tennis was a common ability to mask their intentions. Their dextrous powers of deception were such that they consistently pulled off the tennis equivalent of the three-card trick. They met again in the 1964 final but by that time Santana’s star had waxed and Pietrangeli’s was beginning to wane. On clay, Santana had proved all he needed to prove. So he concentrated his attention on the grass-court bastions: and had luck on his side in that, at Forest Hills and Wimbledon in turn, the most fancied contenders never turned his path. At Forest Hills he played only two seeds, Arthur Ashe (5th) and Cliff Drysdale (8th), and at Wimbledon he played only one, Dennis Ralston (6th). Never mind. Santana beat everybody he had to beat. He had conquered the ‘shamateur’ world on the two extremes of clay and grass. There was an engaging but frustrating appendix to the years of glory. In the 1969 French championships Santana and Gimeno, both 31, clashed after a nine-year beak. It was Madrid vs Barcelona plus, for watching players, a leftover battle between the now united ‘shamateur’ and professional armies. For two sets, Gimeno was too nervous to play his best tennis, whereas Santana’s shot making had a subtle splendor about it. Then Gimeno settled down and in the stress of combat santana pulled a groin muscle and eventually had to retire. Gimeno won 4-6 2-6 6-4 6-4 1-0. Santana and Gimeno had explored different avenues in their pursuit of fame and fortune. Their joint achievement was to lift Spanish tennis to a level it had never reached before: a level that was consolidated by Manuel Orantes and to some extent Jose Higueras. Orantes was runner-up for the 1974 French title and in 1975 he won the first of the three US Open contested on a gritty, loose-top surface. That was a memorable triumph for two reasons. 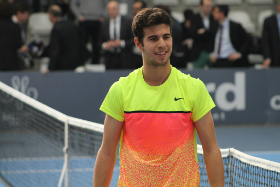 In a semi-final Vilas led Orantes by 6-4 6-1 2-6 5-0 and had five match points. Orantes won, but he was up half the night because he could not tourn off the bathroom tap and had to find a plumber. Then he went back on court and, in the final, gave Jimmy Connors a lesson in the craft of clay-court tennis. She is not a one-hit wonder after all: 2011 US Open semifinalist Angelique Kerber beat Lucie Safarova, Monica Niculescu, Maria Sharapova, Yanina Wickmayer and Marion Bartoli en route for her first WTA title. 19 yr old Lara Arruabarrena-Vecino won her maiden WTA title in Bogota, playing in just her third WTA main draw and facing a 5-2 third set deficit in her opening match. David Ferrer keeps flying under the radar and he keeps winning: after Auckland in January, he captured 2 titles in February: Acapulco and Sao Paulo. Lleyton Hewitt recorded its 38th Davis Cup singles victory, a remarkable 14 more than by any other Australian player. Manuel Orantes has been elected to the International Tennis Hall of Fame in the master player category. Orantes won the 1975 US Open by beating Jimmy Connors in the final, and he was the runner-up to Bjorn Borg at the 1974 French Open. Like father, like daughter: Jessica Korda, daughter of 1998 Australian Open champion Petr Korda, won her first LPGA tournament this month. The place of her triumph: Australia of course. A nice tribute to her father’s infamous “scissor kick”. The Arantxa Sanchez Saga: the Sanchez clan seemed to be a much more normal family than the Grafs and Seles’ … until Arantxa’s autobiography release. Lleyton Hewitt will be sidelined for four months after having surgery on his left foot, but eyes a return in tile for the Olympics. Ranked 170th, the 31 yr old Australian, will have to rely on a wild card from the International Tennis Federation to contest the London Olympics. Aravane Rezai, for her Fed Cup debacle. Andy Roddick: beaten by Denis Istomin in San Jose, ousted by Xavier Malisse in Memphis, Roddick has plummeted to his lowest ranking since 2001 (31). The Swiss Davis Cup team of Roger Federer and Stanislas Wawrinka: 0-5 loss against the US team on clay. Enough said. Will Nadal emulate Santana and Orantes and win the US Open title? Manuel Santana, Andres Gimeno, Manuel Orantes, Sergi Bruguera, Carlos Moya, Albert Costa, Juan Carlos Ferrero: all of those spanish players won at least one Grand Slam tournament. But without a doubt 8 times Grand Slam winner Rafael Nadal tops them all. Australian Open, French Open, Wimbledon, Olympics, Davis Cup, he won it all. The only one trophy missing is the US Open, a major won by two fellow countrymen: Manuel Santana in 1965 and Manuel Orantes in 1975. 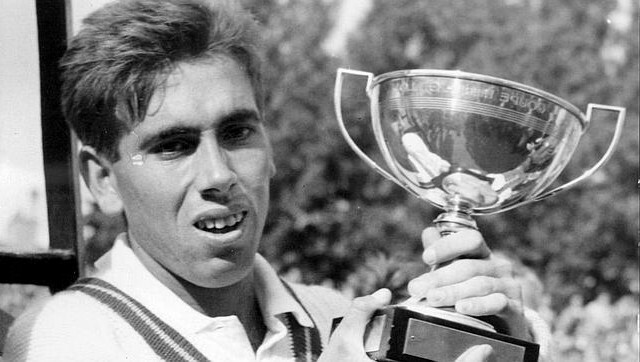 Manuel Santana, now director of Madrid Masters Series, was the first Spaniard to win a Grand Slam title: in 1961 he defeated Nicola Pietrangeli in 5 sets to capture his first Roland Garros title. Three years later the two met again in final and Manolo needed only 4 sets to regain the trophy. In 1965, in a game totally dominated by Americans and Australians, Santana became the first European to win the US title since Henri Cochet in 1928! 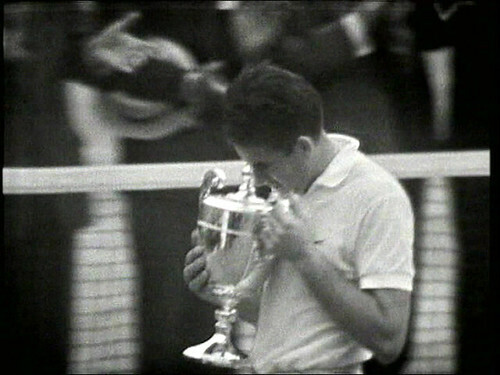 He defeated South African Cliff Drysdale in final, one of the first players in the game to use the two-handed backhand. The ever charming Santana became a national hero in Spain one year later when he won Wimbledon against doubles specialist Dennis Ralston.